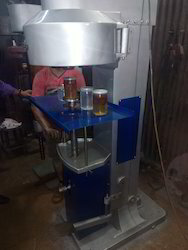 We are a leading Exporter of pet cans seaming machine from Mumbai, India. Capacity UP TO 5 KGS. This machine used for pet can, pp cans top seaming machine . wich is made of tin components, eot, eoe also. packing for dry fuit, rassogula, gulab jamun, ghee, juice aslo. Looking for Seaming Machine ?